Beautiful mountain house on the same slopes of the Sierra Salvada (Orduña). Rest and enjoy a quiet stay with spectacular views. A single floor of 150 square meters: 4 spacious rooms, all exterior. Two of them type suite with bathroom and hydromassage shower included. A room with a double bed and possibility of an extra bed. The other two rooms are double and are complemented by another bathroom. Included linen and towels Large living room with large sofa., library, TV, DVD and music system. Interned WIFi connection. The kitchen is fully equipped including a dishwasher, to make your stay as comfortable as possible. Garden of 500 square meters with sun loungers and BBQ area. 40 km from Bilbao and Vitoria. Orduña train line - Bilbao. 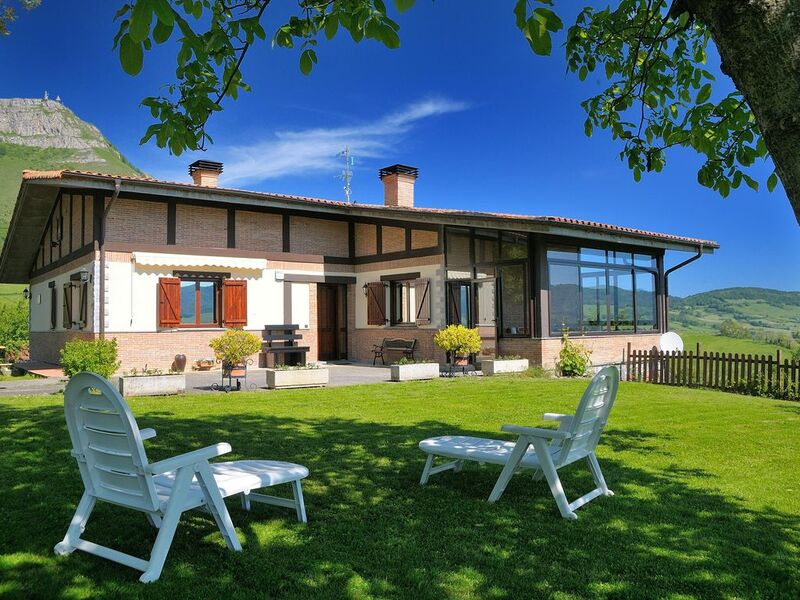 Great house, excellent amenities, spectacular location about 2km from the village of Orduña in the Basque country. About 40 minutes from Bilbao, 90 minutes from San Sebastian, Victoria-Gasteiz and Burgos. The house itself is spacious, well-appointed and beautiful inside and out. Great as a base for adventure, traveling through the region or just relaxing. Immaculada is terrific. I'd go back in a minute. We had a truly spectacular time in this awesome house! The owners (Inmaculada and Miguel) were incredibly kind and generous, making sure we had everything we needed. It's only a short drive into Orduna, which has many nice cafes and restaurants but we also cooked at the house (grilling on the wood grill!). The views are spectacular from the house and also from above in the hills (we hiked into them one day and looked out over the whole valley). There's a train in Orduna that goes into Bilbao (about 45 mins). If you're looking for a most incredible Basque experience, this house is a terrific home base. The house is comfortable, spacious and well-equipped and has a great view down over Orduna and to the high ridges all around. The owner is very welcoming and helpful and lives in the town and the chap who lives downstairs brought us some lovely veg from the garden and made us a delicious tortilla one day too. He looks after the friendly dog who lives in the yard and the cat and her kittens. There is a table and plenty of seating outside as well in the kitchen. The sun room (smelling sweetly of marigolds on our visit) is a bonus too. We enjoyed using the ping pong table and being able to laze in the garden, especially watching the two kittens playing and trying to sneak into the house (not allowed!) There is plenty of good walking and places to visit and we enjoyed watching Basque bands playing at an event in the town. It is worth noting that the supermarket in Orduna is not open on Saturday afternoon or on Sunday so it is advisable to stock up beforehand but we found a small shop near the square that was open with some basic provisions which got us through till Monday. This is not a very touristy area with mostly Spanish visitors it seems and English is not spoken by many so we were very glad that our children speak some Spanish, though many locals speak Basque instead. There are some nice beaches on the coast even though it is a bit of a drive and we loved the Guggenheim in Bilbao. Our (adult) children enjoyed going paragliding from the top and coming over the house to land in a field not far below. We were there for a week and could happily have stayed longer. The property was a delight, as per the description, and finished to a very high standard. The hospitality of the owners matched this, taking time to help us with our plans, accompanying us on one our walks as well as inviting us to join them at local festival celebrations and bowling. We booked the property with the view that we would play golf in and around Bilbao, however the location afforded so much more in terms of opportunity to explore the region far more widely. The local geography was simply astounding, with high peaks, waterfalls and other assorted features. In the event we spend most of our golf time south of Orduna, and also took time to explore Burgos, Vitoria and Pamplona, all reachable in under 2 hours. I would definitely recommend this as a place to stay. Our pick of golf courses were Rioja Alta, Urturi-Izki & Pedrena, and the city of Burgos for all round character and in particular its cathedral which is quite stunning. I think we'll be returning quite soon! We thoroughly enjoyed our 4 day stay here in mid-September. Inmaculada and family are wonderful hosts and made our stay here one of the highlights of our trip. They provided us with excellent information about the local environment. One night we accompanied them to the nearby recreation centre in Tertanga. We had a great time learning how to bowl in the local style: tremendous fun! The property is well-maintained, spotlessly clean and is described very accurately on the web page. The small town of Orduna is a short drive (or 20 minute walk away). The tourist office on the town square is helpful and suggested we take the train into Bilbao. This advice worked out well: the trip was pleasant, inexpensive and the trains run frequently. One of the local bars served the best tapas/pinchos we had on our entire trip! We ate at the Romulu restaurant, on the town square, for lunch and dinner and were most satisfied with the quality of the food and the prices. We did several day trips from Orduna: this location makes it easy to visit the north coast or wine country to the south. This peaceful valley is not in a high tourist area and the relaxing environment provided us with a lovely time in which to get to know the local people and their environment. We hope to visit again and highly recommend this location! We really enjoyed our stay here for a week in August 2012. The house is very comfortable, spacious, tastefully decorated and well equipped, as described in the ad. Our three kids especially enjoyed the garden area, and the views from all directions were superb, as the house is surrounded by majestic cliffs, with peaceful rolling green fields in front and paragliders sailing past the balcony. The charming town of Orduna is just five minutes away, with two small supermarkets and a few cafes/shops, and there is a small bar/restaurant even closer, just down the road. The region is not a heavy tourist area, so if you enjoy staying in a place where you can get a real feel for the local way of life, this is an especially good choice. Within a half hour's drive, there are plenty of nature parks and beautiful walks, including Mt Santiago with marked trails and spectacular canyon views just 10 minutes away in the cliffs. Bilbao and the Guggenheim Museum are just a 30 minute drive. The only drawback of the location is that the Basque Country coast is about an hour's drive, but it is well worth it. The owners (no English spoken) live in a separate unit below the house. They were very friendly, helpful and hospitable, and made us feel at home during our stay. House located in a rural area in the foothills of the Sierra Saved (Orduña), close to Salto and source of the river Nervion. 30 minutes from Bilbao and Vitoria. 2km from Orduña. The house has 150 m and 600 m garden. It has 4 bedrooms: one double with extra bed and 3 double rooms. 3 bathrooms with shower, large living room and kitchen with dishwasher. Terrace with furniture and hammocks. Fronton 100m and bowling Ayales type. Ideal for practicing hiking, paragliding, bike situation. Interest: City of Orduña (free tours), monumental, Dolmen's Hut, Monte Santiago Nature Reserve, Old Virgin Monument on Mount Txarlazo, Délica Canyon, Valle de Ayala. Orduna nearby train with destination Bilbao each 45min and surrounding villages. Library and recreation area with barbecue, games, table tennis, children's football and other entertainment. Pools in Orduna. Depósito al hacer la reserva .El.resto al contado a la entrega de llaves; a la llegada DESCUENTOS EN PRECIO POR NOCHE A PARTIR DE 3 NOCHES . NAVIDADES , PUENTES, SEMANA SANTA, y Fiestas patronales SERAN CONSIDERADAS COMO TEMPORADA ALTA Entrada a partir de las 17:00.h (5 pm) . Salida 11 am.